Having different eye sizes may be a noticeable feature that can lead one to wonder if something is wrong with his health. Still, other people may want to know if one needs to have this condition fixed or treated. The answer may depend on what is the possible cause of having one eye bigger than the other one. So keep reading to learn the information for that. A droopy eyelid may be a normal variation in an individual or it may be due to a disorder such as a nerve problem, an eye infection (like a stye), an allergic reaction, migraine headaches, or an autoimmune condition called myasthenia gravis. It can be congenital or may develop later in life due to aging. Remedy Suggestions. You should seek medical help if the drooping of one or both eyelids is causing problems in vision, if it is progressively worsening, or it is associated with other symptoms. In some people, there may be normal variations in the sizes of the pupils at birth, of which the variation range may be from 0.5 to 1 mm. 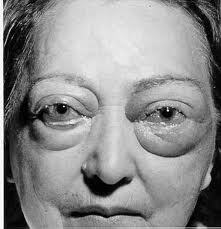 This symptom may also occur to people who have equal pupil size occasionally. 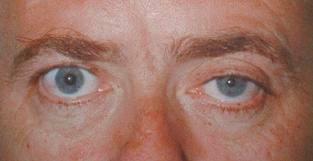 Anisocoria may be a sign of a disorder in the eye, nerve, blood vessel, or brain. Remedy Suggestions. If this symptom occurs temporarily for people with equal pupil size with no other symptoms, there is no need to worry. If there is an accompanying symptom such as changes in vision, nausea and vomiting, fever, or headache, or it occurs after a head injury, seek immediate medical help. Amblyopia results from abnormal development of vision during infancy or early childhood, leading one or both eyes to wander outward or inward, so they do not appear to work together. It may cause one eye bigger than the other. It is usually associated with poor visual acuity and depth perception. Remedy Suggestions. 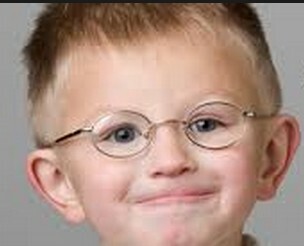 If you notice that your child may have a wandering or lazy eye, have his eyes checked by an ophthalmologist. Amblyopia can lead to mild to severe vision loss, and it should be treated immediately. Some people have one eye bulging, causing it to look bigger than the other, while others may have both of their eyes bulging. This condition, called exophthalmos, is usually due to a medical condition such as a tumor behind the eye or a hyperactive thyroid. Sometimes eye bulging may be difficult to notice because it occurs very slowly and can only be detected through photographs taken at different times. Remedy Suggestions. When an eye appears to be bulging, especially in a child, medical consultation must be done because it may be a sign of a serious disease. 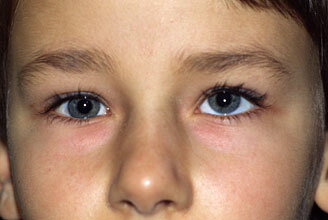 Having crossed eyes or strabismus is common among babies, although it can also be found among adults. It is a condition where one cannot align the eyes simultaneously, such that one or both eyes turn inward, outward, upward or downward. Eye turning may be intermittent or constant. Symptoms of crossed eyes include uncoordinated eye movements, one eye bigger than the other, double vision and decreased vision in one eye. Remedy Suggestions. To relieve the symptoms, you can wear a patch over one eye, do visual exercises, use eye drops, or wear glasses to help in proper focusing. Some people may need corrective surgery if the condition persists. 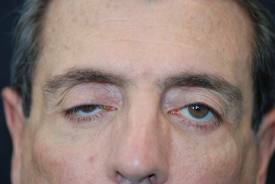 Grave’s disease is caused by overactive thyroid gland. Early eye symptoms are dry or watering eyes and a gritty feeling. The eyes may become sore, red, and swollen and the eyelids may become retracted into the back of the eyeballs, making one eye bigger than the other. Patients may appear to have protruding eyes with permanent stare, and in advanced cases, they may experience double or reduced vision. The swelling can sometimes press on the optic nerve behind the eye, cause pain, and affect one’s vision which can result in blindness. Remedy Suggestions. Seek consultation with your doctor about the treatment of overactive thyroid. To care for bulging eyes, you can apply artificial tear drops to relieve dry eyes. At night, it can be helpful to close the eyelids using eye pads and eye ointment.